This curvy, wide mouthed vase features clouds of tan, hints of pink, and wisps of smoke, finished nicely by a textured grey belt. Simple and earthy yet elegant, this vessel would be a perfect ornamental addition to any office or living space. It is signed and dated on the bottom, and has three felt pads to prevent damage to display surfaces. 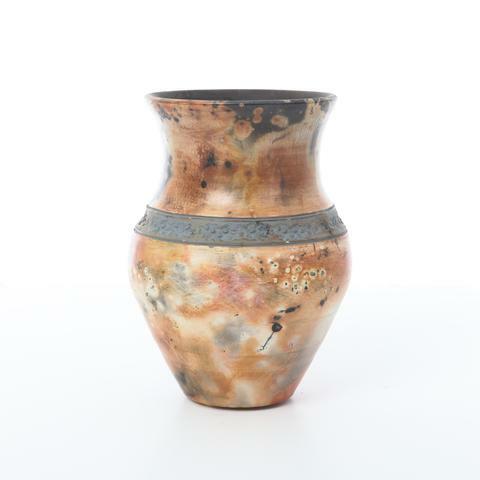 This gorgeous vessel is an example of his work using the saggar-fire technique, a centuries-old Japanese firing technique which, through unique finishing processes and artistic skill, produces individual works of art that are truly one of a kind. Piece measures approximately 7″ high, 5″ in diameter, and could serve as a functional vase or a stand-alone display piece.